WHY CAN'T WE BE FRIENDS? 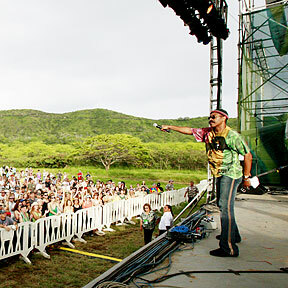 Lonnie Jordan of WAR held a microphone out to the crowd at the Diamond Head Crater Festival yesterday afternoon. The event also featured musicians such as Na Leo, Yvonne Elliman, Linda Ronstadt and the Steve Miller Band. Gov. Lingle calls the extent of destruction "dramatic" in places. The Diamond Head festival returns after a 28-year break. Grandfather Ota's family collects a volume of remembrances about growing up in Waipahu. The Hawaii teen has trouble hitting greens and fairways, but cuts Ochoa's lead to three. Central Tokyo is an immense downtown area which, though crowded, does not feel overly congested and the people are so polite. Once-nondescript self-storage facilities are increasingly offering services like WiFi access, conference rooms and free coffee. About 200 homeless people have been evicted from Ala Moana Beach Park to make way for repairs and maintenance. What issues are Hawaii Democrats and Republicans likely to emphasize as they campaign in 2006?